Front and rear beam moving cutting machine is Receding Head Full Beam Die Cutting Press which is used for large sheet or roll material die cutting . 3.This full beam four column press is using double hydraulic cylinders coupled with with double balanced yoke, self lubricated bushings . 4.Easy operation with two-hand or automatic operation mode, programmable with protection system, protective covers. 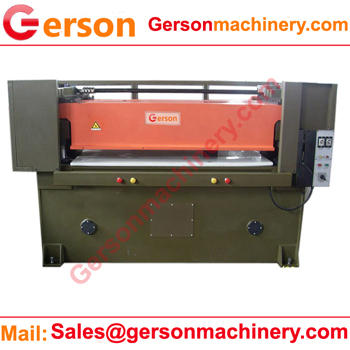 5.The press pressure ,cutting table size ,stroke etc., can custom built by Gerson . .Gerson accept any custom build die cutting machine for your production ,welcome to contact Gerson.